Your children deserve the best and you deserve to relax a bit and spend more time with them instead of stressing over their every meal. We have found the healthiest and overall best kid-friendly meal delivery services that can make your life easier and take perfect care of your children’s diet. Little Spoon is a healthy kids meal delivery that offers fresh, organic baby blends designed by experts on feeding babies and toddlers and created to promote your child’s healthy development. The Good Kitchen is a kid-friendly meal delivery service that offers healthy lunchboxes that kids love. All meals for kids are exclusively made of natural, organic, and non-GMO ingredients. Yumble is a kids meal delivery that caters to little picky eaters aged 1 to 12. Its meals are always natural, its menu is rich and varied, and it offers a range of meals for special diets. 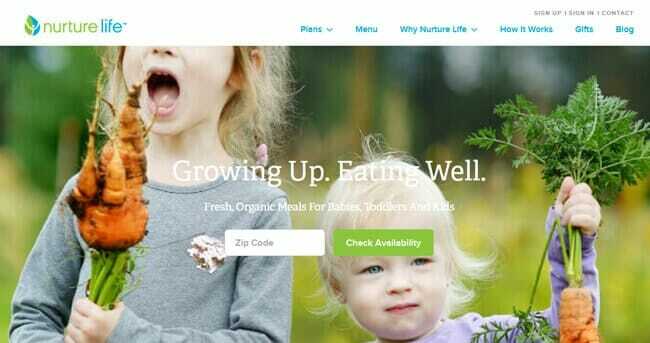 Nurture Life is a healthy meal delivery that specializes in organic meals for babies, toddlers, and children aged 4-14+. It offers 7 meal plans for kids at different stages of development. Top Chef Meals is another kid-friendly meal delivery service that offers a vast range of healthy options for children. Its meals for kids are affordable, natural, tasty, and ready to eat. Getting children to eat their veggies can be a seriously difficult task. Cooking healthy meals for your little ones every day, all day long, and finding the healthiest, most nutritious ingredients is equally time-consuming and may minimize your free time. With kid-friendly meal delivery services, you do not have to spend a quarter of your day in the kitchen trying to make healthy meals that your kids will actually like and want to eat. You can rely on experts, who are often parents themselves and know how to make nutritious meals that look appealing to the little ones and that are also fun to eat. You can choose from a range of natural, freshly made meals every week that are designed with the dietary needs and unique tastes of children in mind. You can choose how often you want to have ready-made, kid-friendly solutions at your disposal and adjust your deliveries to your schedule. You can relax knowing that your children are enjoying food that is good for them even when you have no time to cook. With the kids meal delivery market steadily growing, you have a range of options to choose from and with our list of carefully handpicked choices, can easily find services that offer just the kind of meals you want your kids to eat. You can save time and sometimes even money with reasonably priced meals for kids that are professionally cooked using the finest ingredients and delivered straight to your doorstep. While kid-friendly meal delivery services are not nearly as rare as they used to be, finding the perfect one still takes time, as not all solutions currently available are the best choice for your children. Some may simply offer meals that children usually like but may not pay enough attention to their nutritional value. Some may offer healthy meals that do not suit the tastes of the majority of children. Making a perfect kid-friendly meal takes a lot of knowledge and experience and that is exactly what the best kid-friendly meal delivery services possess. They have registered dietitians and pediatricians on their teams, who have a thorough understanding of children’s dietary needs at every stage of their development. They create meals that are not only safe for the sensitive tummies of little ones but also rich in the nutrients they need as they grow up. They design meals that feed both the body and the mind. Furthermore, they hire professional chefs who understand the preferences of little picky eaters and know how to make the meals look interesting, taste perfect, and completely adhere to the recommendations of experts on feeding babies and children. They make meals your children are sure to love while taking perfect care of their diet. The best kid-friendly meal delivery services are the ones that do not only understand what children need and want but know that every child is unique. By offering meals for children of different ages and preferences, as well as options for special dietary needs, they allow you to stop worrying and enjoy the comfort of knowing that your children are getting everything they need from their meals in an appealing form that can help them grow to love healthy food. Our selection criteria are generally extremely strict, as our goal is to identify the meal delivery services that truly are the best of the best. However, we are even more strict and careful when choosing the best solutions for children. In order to be labeled as the best meal delivery service for kids, a service has to perfectly satisfy all 6 of our top criteria. It has to offer an impressive variety of meals that satisfy the differing tastes of kids. It needs to offer enough meal options to accommodate the needs of children on special diets and allow them to enjoy maximum diversity in spite of potential allergies and dietary restrictions. Portion size needs to be just right. Babies, toddlers, and children over the age of 3 all have different needs, so the portion size must always be calculated in accordance with their age and developmental stage. The nutritional value of the meals must always be optimal. The meals need to contain all the valuable nutrients in the right quantities, thus supporting children’s development and feeding their bodies perfectly. Finally, the best kid-friendly meal delivery services do not only satisfy the needs of children. They need to suit the needs and expectations of parents as well. They must offer flexible subscriptions that can be modified in order to suit the different lifestyles and schedules of busy parents. Not only that, but they need to be affordable, so they fit virtually any parent’s budget. Only the companies that satisfy all of these criteria are the ones that we can gladly recommend to parents looking for a trustworthy, top-of-the-line kids meal delivery that can make their schedule a bit less hectic. The following price comparison is designed to help you easily figure out which of our top-ranked kid-friendly meal delivery services best fits your budget. We have brought all the pricing information to one place, including the shipping costs and details about the companies’ delivery areas, so you can identify the perfect fit in a single glance. What all of our top picks have in common is that they are currently the best kid-friendly options on the market. Now it is time to discover what makes each of these meal delivery companies unique. Explore their distinctive features in the mini-reviews below and choose the one that best satisfies your little ones’ personal needs. Little Spoon is an organic meal delivery for kids that offers incredibly healthy baby blends made of fresh, nutrient-packed, organic ingredients. Its menu includes blends recommended from 4, 6, 8, and 12 months and you can order 1, 2 or 3 blends per day. Created by pediatricians and dietitians, all Little Spoon blends are designed to perfectly suit the dietary needs of kids at different stages of development. The blends are free from artificial products, preservatives, and additives. The Good Kitchen is a healthy meal delivery that offers excellent meal plans particularly designed for children. Its goal is to re-invent the lunchbox and help you save time while choosing only the best for your children. All of the company’s meals for kids are free from antibiotics and added hormones and sugars and made of organic, non-GMO ingredients only. Choose one of the 3 pre-defined kids meal plans or create a custom plan with 7-35 meals per week. Yumble is a kid-friendly meal delivery service that takes the freshest, seasonal, mostly organic ingredients and turns them into fun and healthy meals for children aged 1 to 12. Its menu features 18 lunches and dinners and 4 healthy snacks that can serve as breakfasts as well. Special diet options include vegetarian, egg-free, gluten-free, and dairy-free meals and the dishes are usually free from nuts. Order 6, 12 or 24 meals per week. Nurture Life is a kids meal delivery that exclusively offers kid-friendly meals designed by an experienced chef and pediatric dietitian. It has 7 different menus for babies, toddlers, and kids. There are 3 menus for babies aged 6+, 8+, and 10+ months, each featuring 10 dishes, one 16-item menu for toddlers, and 3 menus for children aged 4-8, 9-13, and 14+, each including 16 yummy meals. The meals are fresh and organic and include vegetarian, vegan, gluten-free, soy-free, egg-free, and dairy-free dishes. Top Chef Meals is an affordable healthy meal delivery with an impressive selection of wholesome, ready-made meals and a special menu designed for kids. Encouraging children to make healthy food choices, Top Chef Meals designs wonderfully nutritious meals that are colorful and fun to eat. All items on the menu for kids are complete meals that include an entrée, a side dish, and a smoothie. The prices are surprisingly good and shipping is free if you order 21 meals.